Victoria Talbot Rice – Life Painting with Acrylics. Vicky was kind enough to share some paintings with us at Outlines. 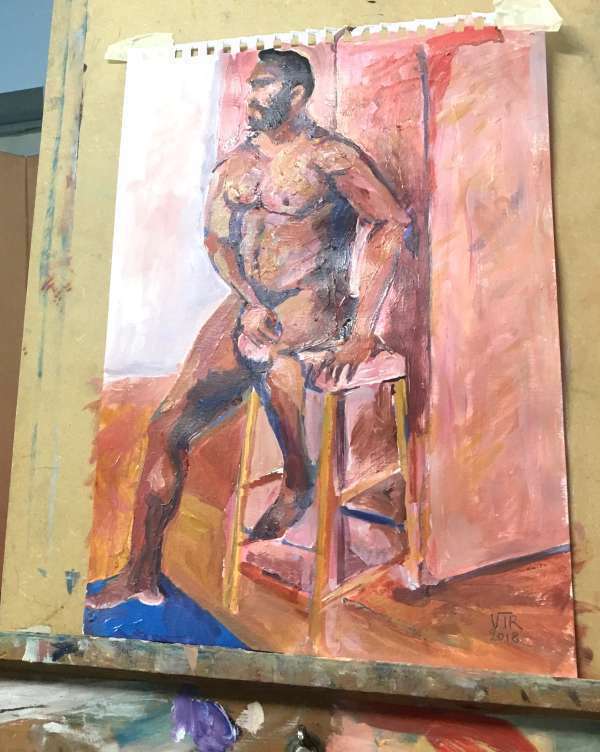 The studies she is working on at her life class show how acrylics are working for her as a student. 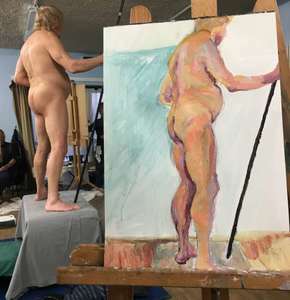 When painting at a life class you need to paint quickly; concentrating on looking at the model, rather than the paint, is important. 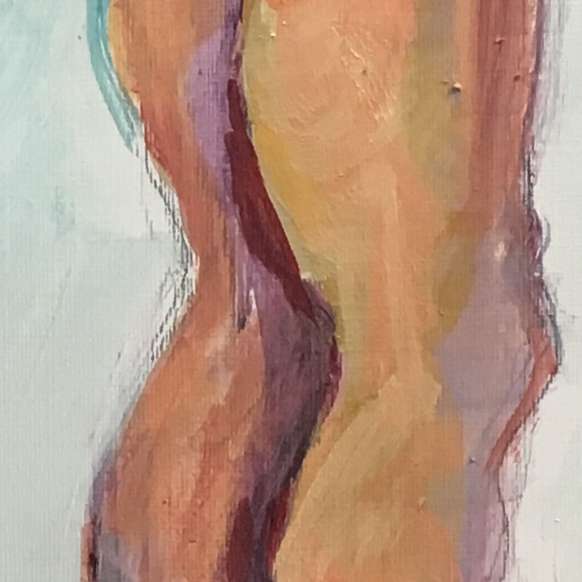 Vicky’s work shows she is painting with attention to the figure as a whole while adding detail only where it is needed. She has used the paint watered down as well as straight from the tube with impressive skill. Read on to see her paintings, close-ups and notes about her use of acrylics. Questions about these acrylic paints? Click here for FAQ. Having sketched the basic shapes in graphite, Victoria has added depth to her painting in layers by painting large areas with thinned paint and building up using a thicker mix progressively. The colours change as more layers are added with only a small amount of blending – she has mostly mixed her colours on the palette before applying them. The big brushstrokes and loose style of this painting achieves a subtlety of colour and sense of form that is very satisfying. The dark leaning stick balances both the person and the composition neatly. I can see little evidence of any sketching in this painting. Vicky has jumped right in using her paints. She has used both brushes and pallet knife to apply the paint. It appears that Vicky has worked on the whole painting throughout, gradually building highlight and shadow. This painting shows some considered decision-making as she has highighted areas to emphasise adjacent areas. 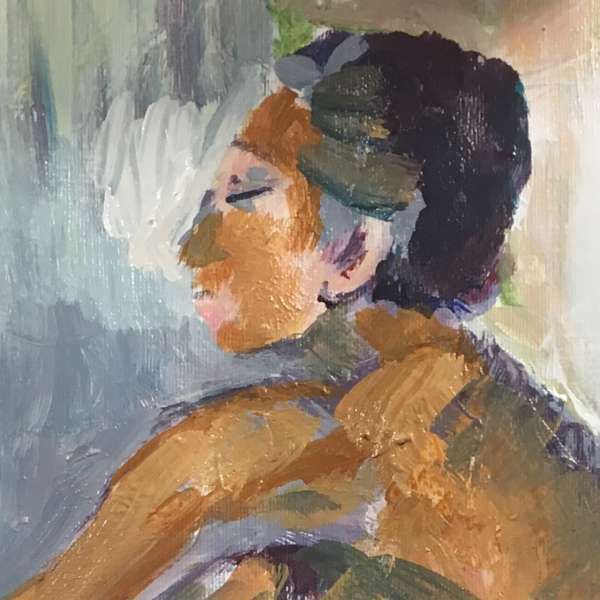 As can be seen in this detail of the head, bold strokes and delicate detail sit happily together and the texture of the paint can be used to great effect. Light layers over dark can be applied so that the colour beneath shows through. The paint can be dabbed, brushed on lightly and scraped while wet to arrive at the result. Vicky might have preferred to have more time to work on this painting but it is very pleasing as it is, and the whole has atmosphere. The painting reveals a productive learning process and shows how delicate areas can be depicted without resorting to fiddly over-painting. 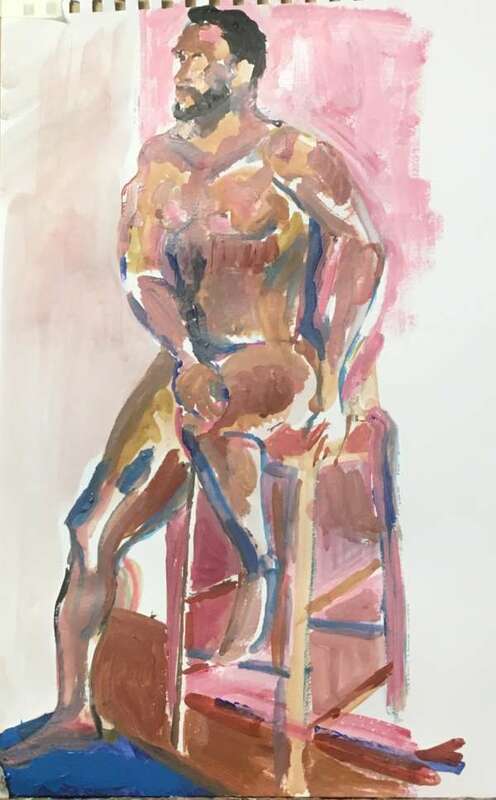 Starting with a small brush to sketch the figure, Vicky has painted this figure with water-thinned paint on paper. 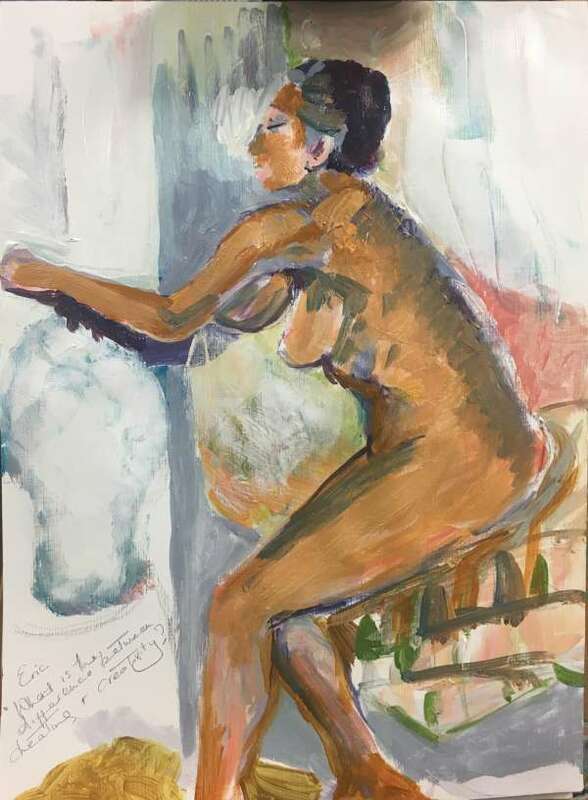 She has mixed her skin tones on the palette applying the paint in long sweeping strokes that give the viewer a sense of confidence that might not have been felt by the artist! Again, Vicky seems fully aware of the whole painting, bringing all the areas to the same level of ‘finish’ together. This close-up shows how versatile acrylics can be. In some parts it looks almost like watercolour while in others the ‘body’ and ‘matt’ look of gouache can be espied. Thicker areas can be seen too, where the underlying colour has been obliterated. This painting is well anchored by the darker area under the stool and the solid blue supporting the man’s right foot. The blue picks up the dark lines in the body, an elegant touch. I received this email from Victoria. 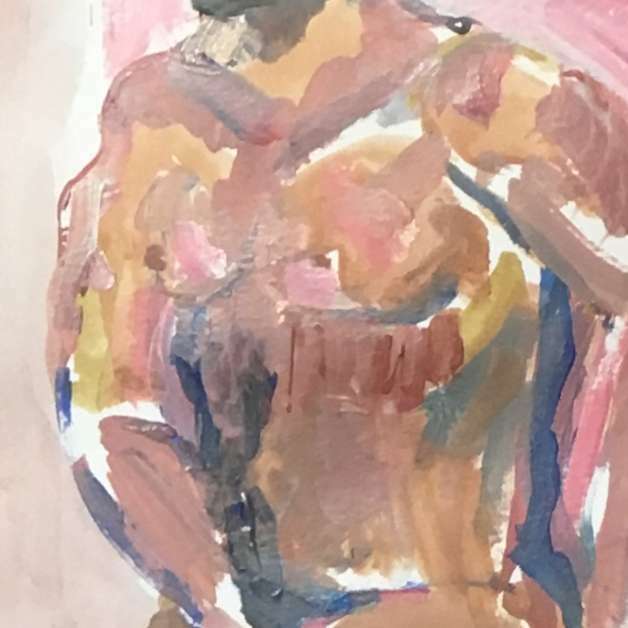 The colour range certainly has adapted well to life drawing skin tones, and I am certain I could also enjoy using them next time I am doing landscape. The paint is a nice texture and doesn’t dry out too quickly indoors. I have yet to try it out of doors. I have not needed to add extra medium so far, although I love experimenting with mediums. 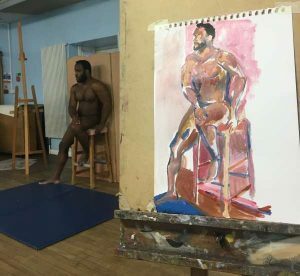 In my life drawing class I am starting off by adding water, and it works well. It is a great medium to use in class. A relief to not need White spirit or other oil based thinners, and nice and easy to be able to swish my brushes clean in water, then just a wipe. The pigments are nice and rich, and the tubes are a generous size for the money and really nice to handle. I am comparing them with other well known brands, and love the colour range and the design of the tubes. A friend has asked me what is the USP on these paints. I just explained that it was a secret! However Outlines Acrylics have certainly improved my work, so he will have to find out for himself! I am happy to recommend the paints. 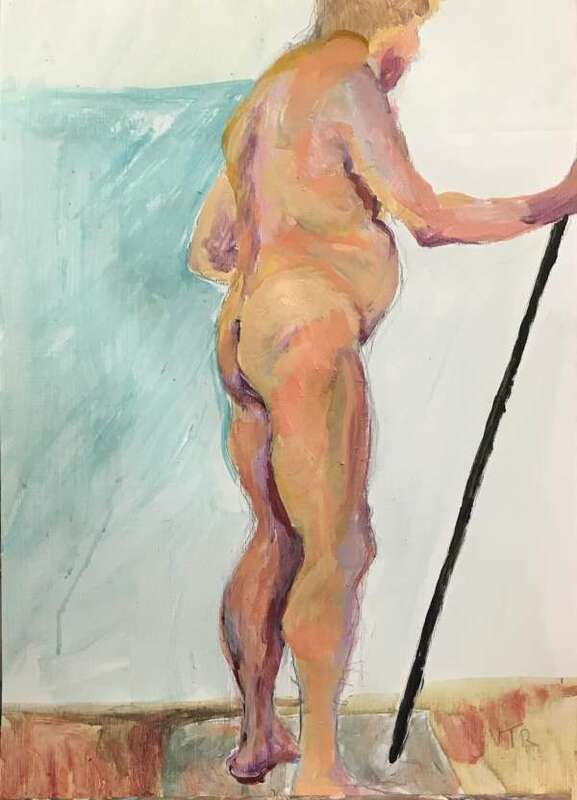 A second painting session with the life model has given Victoria the time to build up the layers of paint giving the body more depth and texture. She has also worked on the background. Thanks to Victoria for sending a photo of the completed painting. It’s a great pleasure to us that Victoria Talbot Rice is using Outlines Acrylics for life classes. Although she says the paints have improved her work, of course it is Vicky herself who has done that; the paint is just a catalyst for her artistic talent but we are happy to have contributed to her enjoyment of painting. Apart from the good quality and low price of Outlines paints, you could say that the ability to buy the white on its own is a sort of USP (Unique Selling Point) … One always runs out of white first. 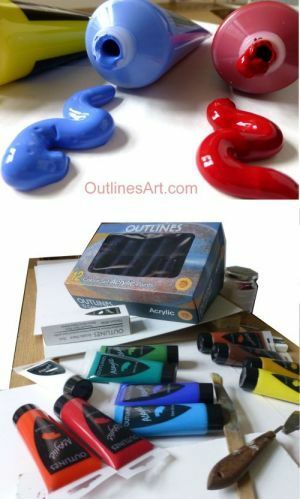 Click to read how you can get your own set of Outlines Acrylic paints. Don’t be shy, Please scroll on down and use the comments box below to tell us, and Victoria, what you think. Your email address will not be published and all comments are moderated. If you enjoyed this post, you might like to be notified of new ones. Sign up now for more articles and tips, delivered straight to your inbox. 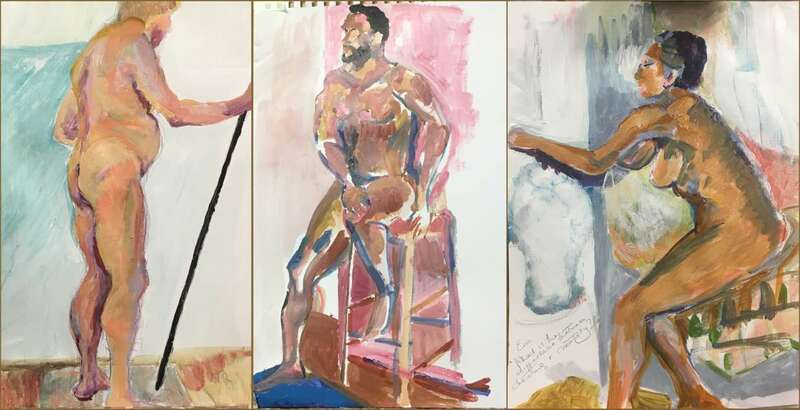 Paintings by Victoria Talbot Rice from a Life class, a look at her painting methods and the results she achieved as a student. Includes her thoughts on using Outlines acrylic paints in a learning environment.